OMSP has Alabama's most diverse trail system at 52 miles, including walking/hiking, mountain bike, on-road bike, and horseback trails. Elevation changes are about 1000 ft, so some trails that reach the ridges are fairly strenuous. Multi use requires rules to maximize safety for all users. Horse trails, marked Orange in color are to be used only by horseback riders. Some trails are hiking only, some hiking and biking in combination. Biking trails are designated red. The general rule on the multi use trails is "heels yield to wheels". To further enhance safety, all hiking trails have trail marker posts along the way. These 4x4 posts, one every quarter mile, are painted in the color of the trail and have a number. This allows anyone to be located at most anytime and is important given the park covers 10000 acres. To reach the park, take exit 246 on I65, turn West on AL 119, then an immediate Left onto Oak Mountain State Park Road at KFC, continue 2 miles to a four way stop, take a left on John Finley Drive. The entrance gate requires a $5 daily user fee. John Findley drive is the main road through the park and the North Trailhead is 5 miles down this road. To reach the South Trailhead, Take a right on Terrace Drive and drive 2 miles. The main hiking trails are Blue trail, White trail, Yellow trail, and Red Road. There are also many connectors so loop hikes can easily be made. Trail maps are available at the entrance gate. 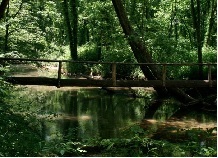 For more information you can go to Alabama State Parks website by clicking here http://www.alapark.com/oak-mountain-state-park . Be sure to visit the other Alabama State Park pages while you are there!